A good, course experienced caddy can be an invaluable resource to improve your game. Golf caddies do much more than just lug around golfers' clubs. They provide advice on shots. They clean clubs and golf balls. They let golfers know the distance between their ball and the hole. While there is a lot that goes into being a caddy, the primary function is to do whatever is necessary can to help a player have a successful and enjoyable round of golf. Even if caddies aren't golfers themselves, they must know the game of golf. They should know the different scores–pars and birdies, for example–and understand when golfers should hit different clubs. They don't need to know when a golfer should use a 6-iron as opposed to a 7-iron, but they should understand that a golfer wouldn't hit a 5-iron to reach a green that's 250 yards away. Caddies also should know the course at which they're caddying, and be able to inform the golfer about water hazards and sand traps. Obtain such knowledge by touring the course or studying a scorecard. One common question golfers ask their caddies is, "Did you see where that one went?" Caddies should always be able to answer in the affirmative. Whether golfers are hitting a drive from the tee box, or pitching onto the green, caddies should watch the ball carefully and know where it went. Even if you don't see exactly where the ball landed, you should know the general area and be able to locate it quickly. When golfers hit a shot, and a piece of sod flies away along with their ball, it creates an ugly hole on the golf course. Caddies are responsible for replacing the divot. Once golfers hit their shots, caddies should retrieve the divot and put it back where it came from. Step on it lightly so it stays in place. Place sand in the spot if you cannot find the divot. As much as they try to avoid it, many golfers at some point hit their ball into a sand trap. Hitting their ball out of the trap requires walking into the trap, hitting the ball and then walking out. It all creates a disturbed surface, and fixing it is the caddy's responsibility. Once golfers are done hitting out of the sand, caddies should grab a rake and make the surface smooth for the next golfer. Caddies are responsible for cleaning golf balls and golf clubs, and for keeping the golfers' bag organized. Before the round begins, take note of how golfers have their clubs organized. After each shot, put the club back where it belongs. Caddies also should carry a towel to wipe clubs after each shot and clean their player's golf balls at the beginning of each hole. 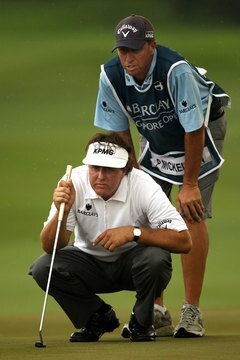 What Are Some Tips for Being a Golf Caddy?